Hi, friends! I’m here today to share all about how I organize my classroom library… AND to bring you a GREAT giveaway from fellow blogger Maria over at Kinder Craze! We were provided a copy of the Classroom Library Labels to give away. All views and opinions expressed are purely our own. 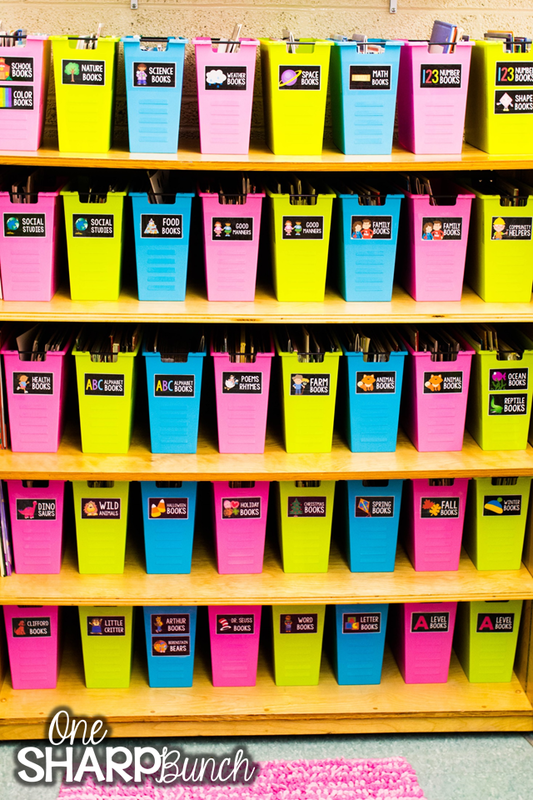 When I shared the following picture in my classroom reveal, Maria thought it looked like eye candy… and she graciously offered to give away a set of her Classroom Library Labels! 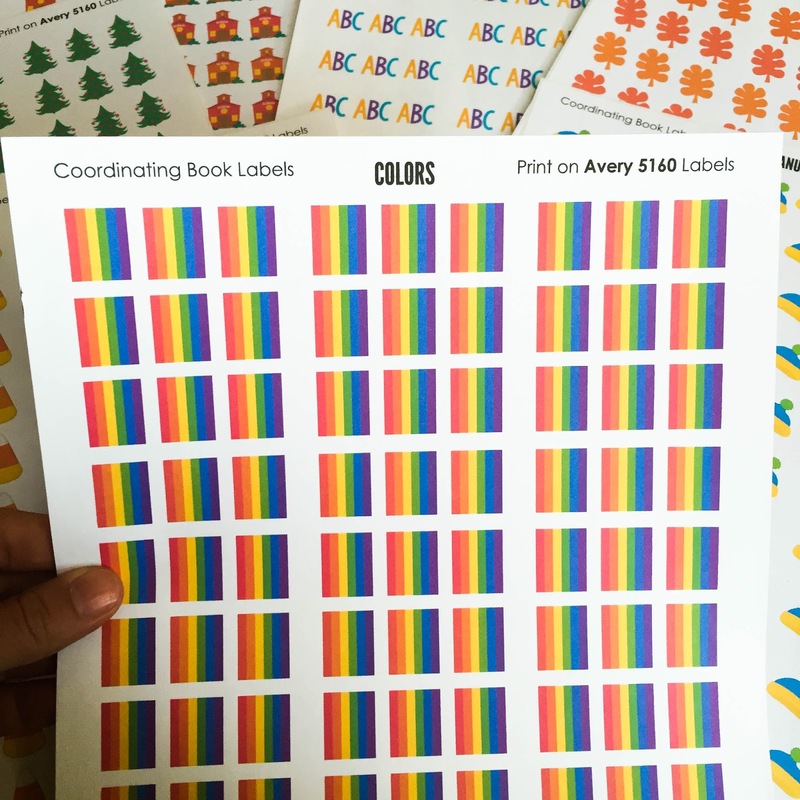 But before I get to the giveaway, I wanted to share how I used these labels to organize my library by theme and by reading level. Sorting all of my books by theme wasn’t a difficult task, but it sure was time consuming. I actually spent the better half of my first year (many moons ago) sorting them and placing them in clear, plastic shoebox type tubs. Then last year (many moons after my first year), I came across Maria’s post about her simplified classroom library. Once I realized she purchased the bins from Big Lots, I hit every Big Lots 120 miles north and south in search of enough bins for my classroom library… and voila! I couldn’t wait to begin labeling my bins with Maria’s labels. Some of the labels I customized with her editable labels to fit the themes of my already sorted books. I used packing tape to attach each label, but you could also laminate them and use a hot glue gun. After I had all of my new tubs labeled, I began labeling the back of each book with the matching labels from Maria’s set. I printed mine on sticker paper, and used my paper cutter to cut them apart. Then, I got to work relabeling my leveled library. I began collecting books for this library my first year teaching. Most of the books are from Scholastic, Creative Teaching Press, and The Wright Group. Every time I place a classroom book order on Scholastic, I always order some additional books for our leveled library. I also like to use Scholastic’s Book Wizard to help determine the level of each book. My classroom library looks so much better, and it is so much easier for the kiddos to place their books back in the correct tub! If you’d like to check out Maria’s Classroom Library Labels from her Black Series, just click on the picture below. You can also enter the raffleocpter below for a chance to win a set for your own classroom library! Don’t forget to check out my “Classroom Organization” board on Pinterest for more organizational tips! Follow One Sharp Bunch’s board Classroom Organization on Pinterest. I’ll be back later this week with some more teacher talk! Until then… happy organizing! Just pinned and entered! I love those bins too and wish I purchased more since they no longer have them. What do you do about the little black rods that fall off?